Police searching for shooter’s female companion after attack which left more than 20 dead, 100 wounded. 2 Police officers among dead. The gunman responsible for a deadly shooting attack at a country music festival in Las Vegas has been identified as 64-year-old Stephen Paddock, a resident of Mesquite, Nevada. Police say Paddock had a criminal record, but no known ties to terrorism. Authorities are now searching for the shooter’s roommate, a 62-year-old woman identified as Marilou Danley, whom police have called “a person of interest”. More than 20 people were killed when the gunman opened fire just before 10:30 a.m. local time Sunday night on the Route 91 Harvest Festival country music show at the Mandalay Bay resort in Las Vegas. In addition, some 100 people were wounded in the attack. 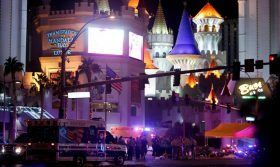 The attacker fired a fully automatic weapon from the balcony of a 32nd-story room in the Mandalay Bay hotel, hitting dozens of concertgoers. Witnesses say the gunman fired hundreds of rounds. Police shot and killed the attacker, whose victims included two police officers. Two other officers were wounded by the gunman, including one officer in critical condition. Clark County Sherrif Joseph Lombardo said the gunman was a resident of the Las Vegas area, but did not release the attacker’s name.